See the USA in your Chevrolet! Dinah Shore belted out this musical advertisement on the “Dinah Shore Show” in the 1950s.Where was the best place for Sapulpans to buy their Chevrolets? Why, Standard Chevrolet, of course! My father bought his first showroom-new pickup from Standard Chevrolet. It was a shiny, new, green and white, 1955 Chevrolet 3100, with such extras as painted front bumper and a rear bumper. It even had a heater. Dad kept that truck for eleven years, before selling it. I learned to drive in that truck and fondly remember having to step on a button on the floor to engage the starter. My father bought my mother a new 1959 Chevrolet Biscayne (which was the bottom of the line) from Standard Chevrolet. Dad, being quite frugal, did not believe in buying “fancy” cars. It was a “standard shift,” on the steering column. In gear head jargon, it was referred to as “three-on-the-tree.” My mother never quite mastered a stick-shift and drove around town in second gear all the time. My father finally acquiesced and bought her a 1961 Chevrolet Corvair Monza from Leonard Marsh, a Standard Chevrolet salesman who lived around the corner from us. The Corvair was GM’s answer to the Volkswagen. It was rear-wheel drive and the air-cooled engine was in the rear. My mother loved that little car, especially since it was an automatic transmission. It had a gearshift lever on the dashboard and was small and sporty. I remember one cold November evening, while Dad was cruising down South Main Street, the Corvair died on the bridge. We coasted to a stop and my father got out and walked to the nearest house to use the telephone. (Remember doing that?) He called Joy Bacon, who was a mechanic and wrecker driver for Standard Chevrolet. Joy came out within a matter of minutes and towed the sad little car to the garage and gave us a ride home. As it turned out, the fuel pump was defective, which made my dad angry because the car only had 75 miles on it. There was no charge for the tow and Joy fixed the car under warranty and everyone was happy. Since Standard Chevrolet was the only wrecker service in town, with two wreckers, which meant they were called out on most of the wrecks.SPD officer Logan Gantz(left) and OHP officer, Bill Green work a rollover accident. Pete Belk is the wrecker driver. In those days, the arrival of the new model year vehicles was quite spectacular. The drivers would either cover up the new cars and trucks on the transport or bring them in at night. The showroom windows would be covered with paper so you could not see inside. My buddies and I waited in joyful anticipation for the first glimpse at these latest engineering and styling marvels. You have to understand that each manufactures’ cars did not look like every other one and each year there was some new design twist. It was a family-owned-and-operated business; therefore, we knew the owners and employees. I remember several of the salesmen such Leonard Marsh, who was our neighbor; Claudie Stevens, who worked there for many years and later opened his own car lot; Bob Chambers, who was a distant in-law and also opened his own car lot; and, last but not least, Don Engle, the father of the Creek County Treasurer, Don Engle. For years the building housed the popular Sooner Tire shop before being purchased by Cecil And Sons Tire, which is what it remains today. 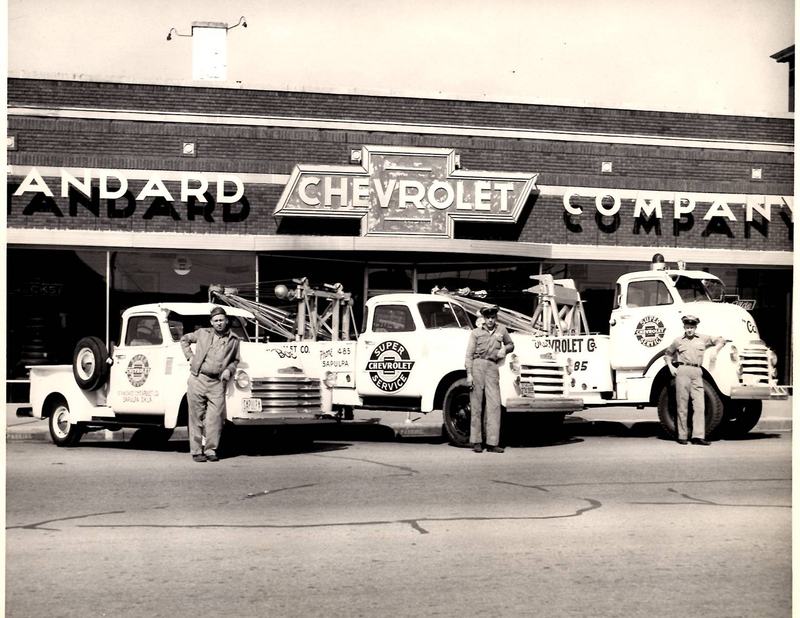 Standard Chevrolet, which had been started by Earle Berryhill and Fred Cowden, was fully acquired by John Bingman, Earle’s son-in law. In the early ‘70s, the name was changed to Bingman Chevrolet, and in 1982 sold to Roger Ray Chevrolet. Eventually, the building became the home of Sooner Tire. Sooner Tire later closed and the building is now occupied by Cecil & Sons Discount Tires. Like so many Sapulpa Business that are long gone, Standard Chevrolet, its owners and employees, will be fondly remembered by many people. ← Pastor Wimmer: Are there things we’d rather have than Jesus?